Papanui Road | Fleetwood Construction Ltd.
Papanui Road is one of the busiest streets in Christchurch. When designing their home this family wanted plenty of off-street parking to keep their cars safe, as well as a relaxing outdoor and garden area sheltered from the noise of the busy thoroughfare. We designed this home with great care and consideration, taking into account the shape and placement of the house to maximise the outdoor spaces while allowing easy access to the two garages. By extending this house to the edges of the property’s boundary, we were able to use the land to its full potential, while still creating extra off-street parking from Papanui Road. The fall of the section is uneven, which means a small section of the house’s foundations sits 500mm above ground level. We designed and built the deck to disguise the exposed foundations, as well as minimise the step down when walking outdoors to create a better indoor/outdoor flow. Out the front of the house, we built up the driveway to create a similar effect. By fitting cedar to one of the garage doors, we created a more welcoming entrance to the house that isn’t dominated by the garage. Even before you step over the threshold, the double height entranceway creates the perception that the ceilings are higher than the 2.4metres they actually are. Combined with the stark ‘Resene Black White’ colour palette for the ceilings and walls, plus natural timber flooring, the entrance adds to the image of a large, grand home. The narrow glass detailed panelling inserted into the hallway wall offers glimpses of the living area before you reach the entrance. You get an immediate sense of the smooth indoor/outdoor flow as the large water feature in the entry hall draws your eye through the home and out into the north facing outdoor living area and landscaped garden. The three main bedrooms are upstairs and strategically positioned to get the most from the sun at different times of the day. The Master bedroom has a stunning ensuite and walk-in wardrobe. The large north facing windows ensure a peaceful retreat at the end of the day, or on a sunny afternoon with a book. Downstairs you can find the spare room, currently being used by this family as a home office, which has direct access to the working garage or man cave. 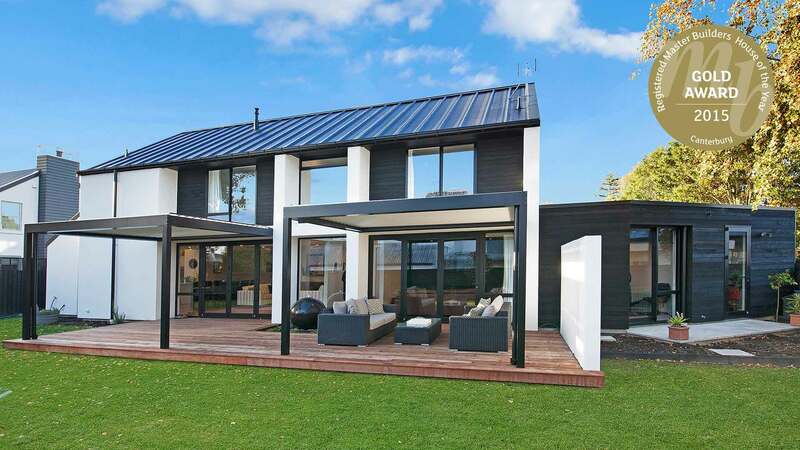 Homes in Christchurch with large north facing windows need extra help with climate control. Generally, these living areas are uncomfortably warm in summer and can suffer from the cold in winter. Installing a central ducted heating and cooling system in the ceiling around all the steel work in the house was a challenge, but with careful planning and co-operation from our heat pump installer, we didn’t need to change the house’s designs. Every detail of this inner-city home focuses on maximising the available space while achieving a seamless look with sharp lines to optimise the light-filled space. This house on Papanui Road has been built with a huge amount of care and passion and is now proudly a family home. Planning on building your next family home? Are you inspired by this award-winning house and want to know more? Contact the team at Fleetwood Construction for a free, no-obligation chat about your building plans and ideas on 0800 381 381. © 2019 Fleetwood Construction Ltd | Designed and Developed by Pinnacle&Co. Ltd.